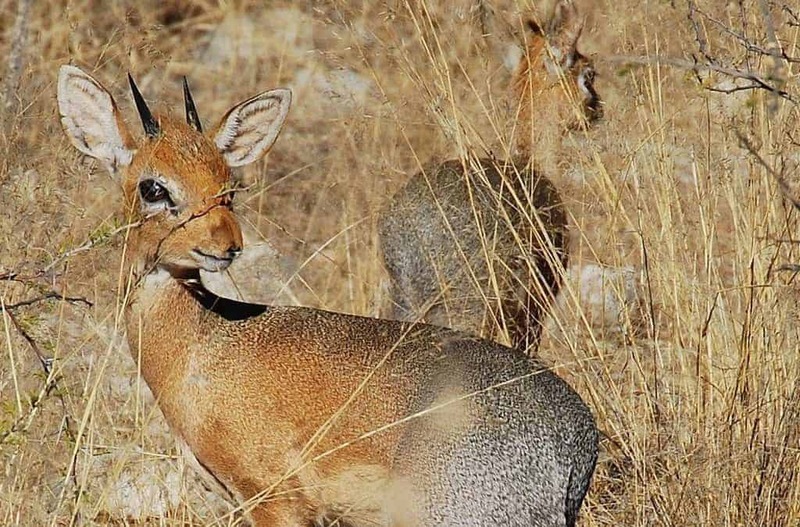 The Damara dik dik, or Kirk’s dik dik, is the Namibian version of the more common steenbok. Apart from being much rarer than their distant cousin, the Damara dik dik is also smaller with a grey-brown upper body instead of rufous (a reddish brown) coloured, and has a distinctive crest of long hair on their forehead which is absent in the steenbok. Other uniquely characteristic features of the Damara dik dik is their mobile nose which is capable of moving in any direction in its search for food, and the black rubbery shock-absorbing pads found towards the back of each hoof. Only the rams have horns, and they are about 10cm shorter than their feminine counterparts, tipping the scales at just 5.1kg as opposed to the ladies 5.6 kg. This tiny frame makes them one of the smallest antelope in the world. Their small size means that every mouthful counts when it comes to feeding and they browse on only the most nutritious leaves, pods, and flowers that they can find. The Damara dik dik will drink water if it is available, although they are not dependent on it at all. Being drought tolerant makes these tiny creatures supremely adapted to Namibia’s harsh environment, where they frequent dense thickets or dry rocky areas. They are also known to conserve fluids by producing the driest droppings and most concentrated urine of any ungulate worldwide. Dik dik are extremely territorial, but non-aggressive, simply moving on to a new territory in the face of stiff competition. They are most often seen in pairs, or singly, and are thought to mate for life. After a gestation period of about 160 days, a single fawn is born during the rainy season and is driven off after about 7 months. Unusually, dik dik young are born with their legs stretched backwards along their sides as opposed to forwards like most antelope. Monitor lizards, caracals, lions, hyenas and wild dogs are their main predators, but they are also hunted for their skins which are popular for making gloves, with one skin yielding only enough for one glove. Oddly the Damara dik dik doesn’t frequent Damaraland but may be seen in the Waterberg, Okonjima, Etosha National Park, and along the Caprivi Strip. Of these, the Waterberg is most easily accessible from your Windhoek accommodation, just over two hour’s drive away, so head out to this pristine wilderness area, during your stay in the city for a daytrip to see if you can spot one.